Over the decade or so that I have worked with clients on creating professional resumes and executive career documents, the presentation of accomplishments is almost always in need of a major overhaul. What are the most common problems – what’s wrong? Yellow Brick Path has been named the Best Career Coaching Firm – Texas and received an award for Excellence in Lifetime Career Management 2018 by US Business News. The CEO of an online job search community was asked if job seekers should have their resumes professionally written. He said "The answer is a resounding YES!" The average compensation of our members is $180,000 with an average tenure of 5 years. That makes the value of the next job $900,000. If you were marketing a product worth nearly $1 million in revenue, would you write the advertising copy yourself? Not likely. So why would you write your resume without professional assistance?" Tell Me About Yourself…? Beyond being the most common interview question, it is also important when meeting anyone for the first time. 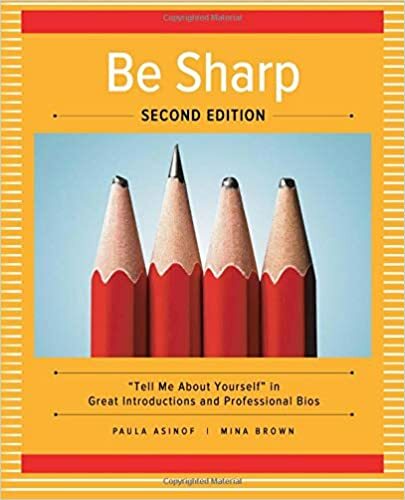 Even though this time-tested recipe for introductions hasn’t changed, the updated version of the book brings the information current with new examples consistent with the evolving job market and networking world. Your introduction can also be the foundation for a one-page professional bio, your LinkedIn profile, website bio, and marketing materials. Available in paperback, Kindle, and Spanish editions. Everything you’ve been doing could be wrong! The authors have helped hundreds of clients unravel all sorts of messes that have resulted from bad advice, much from seemingly expert sources. This collection of substantive yet entertaining essays challenges assumptions and shakes the trees of conventional wisdom with advice that is straightforward, intuitive, and easy to apply. In today’s coaching environment, professional coaching frequently involves career coaching. Often coaching engagements, especially in the business or executive arena, include helping clients figure out what to do with their careers, how to advance in a company, and how to conduct a job search. This workbook is packed full of useful concepts and tools for successful career management coaching. Would you like coaching along with the book? There is a special offer available through Coach Academy International. You get the book along with assistance from the authors. Click here for our recommendations! The first ninety days are, most of the time, spent meeting people, understanding issues, developing plans and assessing talent. It is a time when an executive sees things that will be filtered out by the end of onboarding with the organization. Within public companies, boards are likely to need reorganization and in some cases changes in directors and executive leadership expertise. Boards will be tasked with a greater level of “independence” among its Directors. © 2019 Yellow Brick Path. All Rights Reserved. Web site by Full Moon Design Group.